I spend a lot of time in Phoenix visiting my mom, and I’ve often asked her friends if they know of any noteworthy macaroni and cheese in the area. I’m always hoping to discover a great little bistro or a genuine soul food palace, but invariably people tell me, “Cracker Barrel has wonderful mac and cheese.” Ugh. That’s what I get for using a polling sample whose median age is 75. Cracker Barrel is a chain that revels in a fake homeyness that sets my hair on end. And I resent any establishment that forces me to not only leave but also enter via an overstuffed tacky gift shop. But “Cracker Barrel” was the only answer I was getting, so I finally gave in. Who knows, maybe their mac is a sparkling gem in an otherwise brass crown. The verdict: Not so much. In fact, the best thing I can say about the Cracker Barrel macaroni and cheese is that, according to their menu, mac and cheese is a “vegetable.” It’s official! Congratulations, Weheartmac Nation!! Wooo!!! The Cracker Barrel mac might actually be baked, because a telltale scrap of browned cheese perched atop the small mound of noodles that arrived at my table. But there’s definitely no topping involved, so ten thousand Hilary Demerits for that. The texture wasn’t awful, it was probably the most toothsome item I sampled at that meal, and it was respectably saucy. Like a li'l kitty cat, I almost wanted to lick the bottom of the bowl. I wonder if they use evaporated milk, because there’s a compelling uber-milky flavor going on in there. But it might just be the “processed cheez food” that inevitably must play a big part in this dish. I might have been in a better mood and more predisposed toward liking the Cracker Barrel mac if not for the fact that I made a glaring error when I ordered my meal. The folks who recommended Cracker Barrel’s mac also spoke highly of their fried apples, their “Chicken n’ Dumplins” and their hash brown casserole, so those are the things I ordered. Less than two minutes after placing my order, the server returned with a big plate of mushy food that was all the same color (beige) and pretty much all indistinguishable. Obviously it had been slopped onto the platter from big vats of “food” that was prepared hours ago. Ugh. I begged my server to bring me something green, an actual vegetable if possible, and she returned in under sixty seconds with a bowl of green beans that looked like they had been pre-chewed for my convenience, and they were definitely overcooked but at least they tasted like something (mostly, salt), unlike nearly everything else on the plate. I probably won’t return to Cracker Barrel for this macaroni and cheese, but their breakfasts didn’t look too bad… Anyone wishing to dissuade me, please do so in the Comments ASAP. Epilogue: There is an old saying about how the good Lord watches over babies and fools, and this came to mind when, as I tried to depart the restaurant via the overstuffed tacky gift shop, something magical caught my eye. Yes, there was a reason I was brought to this place: Cracker Barrel sells Valomilks! If you don’t live in the Midwest and/or you haven’t read Steve Almond’s hysterical book, Candy Freak: A Journey Through the Chocolate Underbelly of America , you may not be aware of the elusively delicious Valomilk candy. It’s shaped like a peanut butter cup, but made of dark chocolate instead of milk chocolate, and the filling is runny marshmallow loaded up with a triple dose of vanilla. I don’t even like marshmallow, but to me it tastes like a thick vanilla milkshake that oozes out when you take a bite. The stuff runs down your chin and you’ll have it in your hair until bathtime. And it’s so dang good! Valomilks are delicate creatures that tend to explode and leak when subjected to the pressure fluctuations of air travel, so it’s rare to see them outside a certain radius of the Kansas City factory where they are lovingly crafted. I guess Cracker Barrel trucks them into Phoenix along with the huge vats of processed cheez food and pre-chewed green beans. 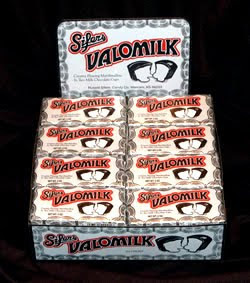 And I’ve gotta say that, no matter how rhapsodic I feel about Valomilks, $1.79 for a two-pack is highway robbery. But that happy little confection rescued my entire day, and for that I salute you, Cracker Barrel! Just not for your insipid mac. Sorry. Cracker Barrels are notoriously inconsistent - Spending a great deal of time in Phoenix with my mother as well, I discovered that the one near her house (the one on North Litchfield road) is one that is not so good. However, when I made a cross country road trip with my mother (who loves the beige cracker barrel food) I discovered that the ones in the Midwest seems to be better - the vegetables were fresh and not boiled to death - the biscuits were fluffy and light. 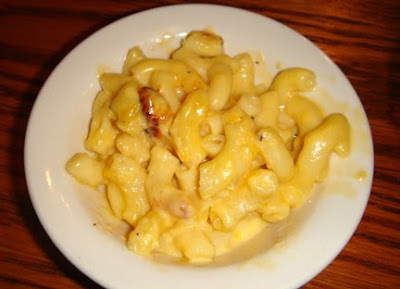 And as I recall, the CB is Norman, OK had some fine mac and cheese. Not good enough for me to ever drive to Norman, OK again but it was quite tasty - and the candy shop on the way out often holds treasures (if you can get past all the other crap). You are so right: the biscuit was delish. And beige! Copyright 2007 Multiple. All Rights Reserved. Designed by Free CSS Templates. Converted for blogger by Blogger Templates.